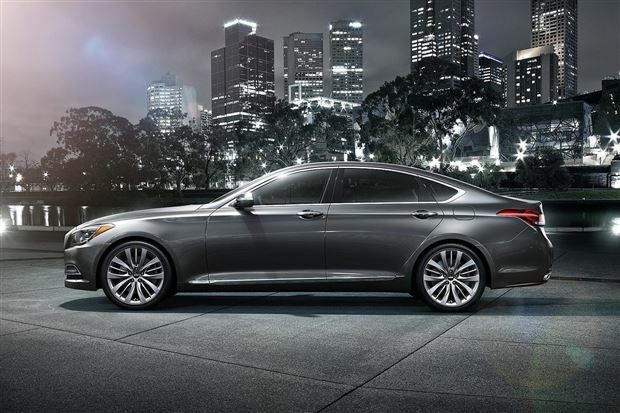 The International North American Car show, which took place in January 2016, has become a place of the world debut of a full-size sedan under the name GenessG90 – the “firstborn” of the premium Hyundai’s sub-brand. Its prototype was first introduced to public in Seoul in December 2015 under the name “EQ900”. 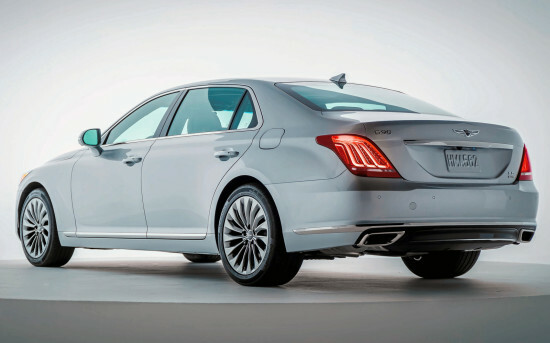 The novelty, which came to replace Hyundai Equus limousine model, executed in «Athletic Elegance» concept design has received new powerful engines and rich functionality, in no way inferior to the eminent competitors. Externally the new Korean sedan Genesis G90 looks pretty, upper-crust and impressive. In its overall dimensions the novelty with the European “F-Class”: length – 5205 mm, height – 1495 mm, width – 1915 mm, wheelbase – 3160 mm. Depending on modification in the “curb” state the premium sedan weighs from 2420 to 2595 kg. 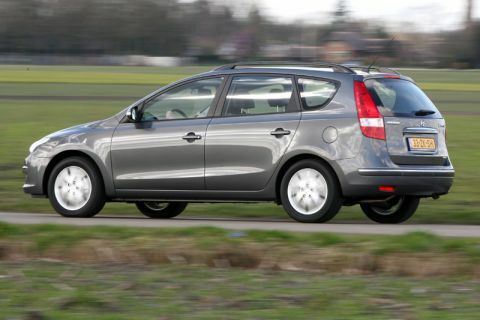 Its luggage compartment counts 484 liters of space. In the niche under the raised floor of the car hides a spare wheel with a set of essential tools. 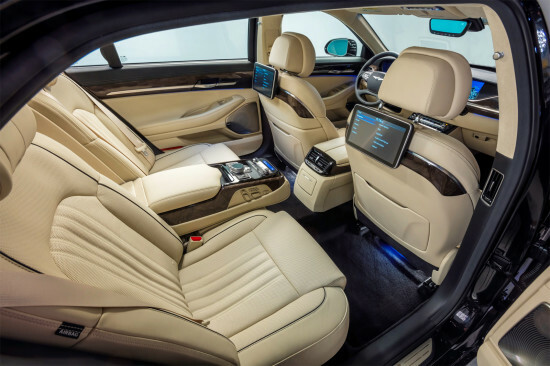 The interior of Genesis G90 is built in complete harmony with the exterior – inside the vehicle can boast with a balanced respectable style combined with natural materials and high quality of assemblance. Exemplary informative instrument cluster combines arrow pointers with a multicolor screen of on-board computer, and its high-class steering wheel carries a high functional load. 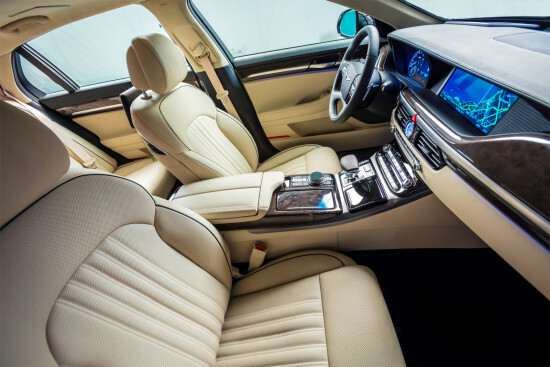 Heated front seats of Genesis G90 are aimed at comfort – they are equipped with the best profile, ventilation and electric drives of multiple adjustments. 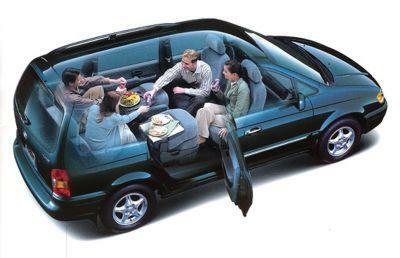 In the rear of the cabin of a full-size sedan placed a luxury class apartment equipped with comfortable “smart” sofa and an impressive supply of the “living” space. Baseline engine – is a turbocharged, 3.3 liter unit (370 hp, 510 Nm, the V6), followed by atmospheric 3.8-liter unit (398 Nm, the V6 315 hp) and atmospheric 5.0-liter unit (V8 425 hp and 520 Nm). 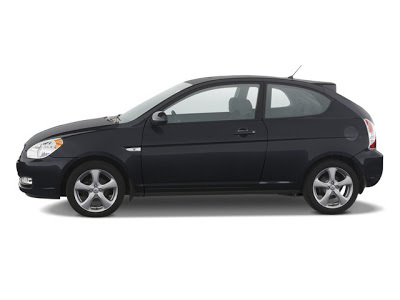 All engines are equipped with direct fuel injection, each running with uncontested 8-speed automatic transmission. 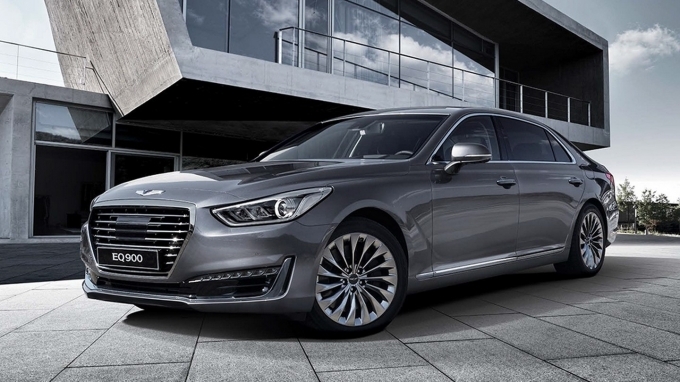 In its homeland in Korea Genesis G90 sales began last December. In a “base set” the machine has nine airbags, adaptive steering, three-zone “climate”, bi-xenon headlights, front seats with electric drive and ventilation, premium multimedia complex with 14 speakers, high-quality interior trimming and an impressive variety of modern assistance systems, responsible for safety and comfort. 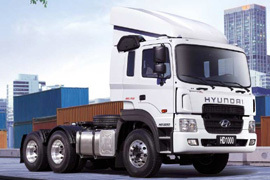 Distinctive features of the top version are: entirely LED optics, 19-inch wheels, twin rear seats with two monitors of infotainment system, ventilation and electric drive, all-sky cameras, “semi-autonomous drive” and a great number of other equipment. 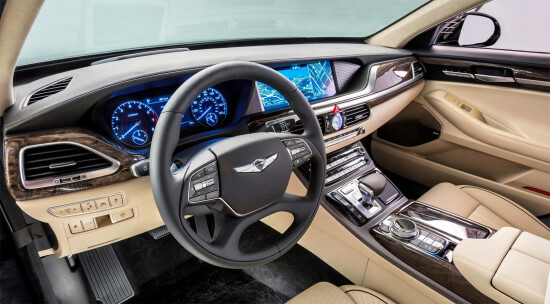 There are photos of the interior and exterior of the car Genesis G90 (2016-2017) category HYUNDAI posted on the site. All photos of the car Genesis G90 (2016-2017) can be downloaded for free on the PC.